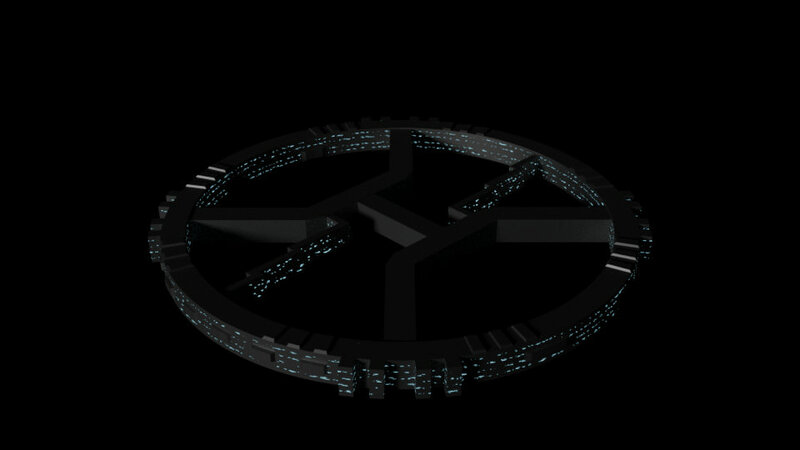 And maybe the start of a space station. Though it certainly has a long way to go. Nice job with the clouds on the Earth like planet. I'm looking at the mountains and thinking they appear abnormally tall, like the scale is a bit off. Reminds me of those claims where if you accounted for scale, the earth would be smoother than a basket ball/bowling ball/billiard ball. Naturally I had to go look that up. Turns out those calculations are based on diameter variation, not smoothness of the surface. For smoothness compared to a billiard ball, it's apparently more like sandpaper. Maybe the numbers in there will be useful for scale. Another thing catching my eye now, is the meteor impact craters look a bit off. The mountains and the craters appear to overlap each other. I assume one would obliterate the other. The last planet is a pretty nice art shot. 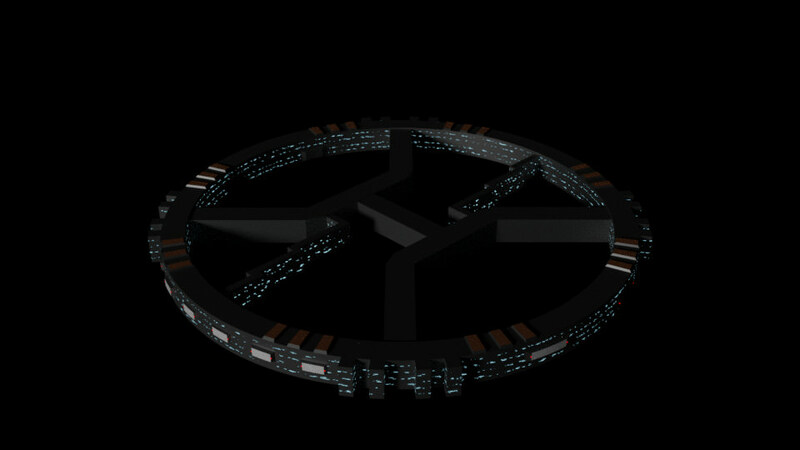 What gave you the inspiration for the spokes of the space station wheel? It's oddly non-regular in a strangely symmetric way. It's intriguing. Makes me want to know why, though not so odd that it's unbelievable. - The mountains are abnormally tall. I did that intentionally because I wanted to see some relief. It just felt more interesting while I was working on it, though in reality it would certainly be quite flat. - Also, the meteor impacts are just a trick with a texture overlay, so they are also relatively unrealistic looking. However, I was a bit impatient and wanted to get something to use as a backdrop. It was really to help me with this. 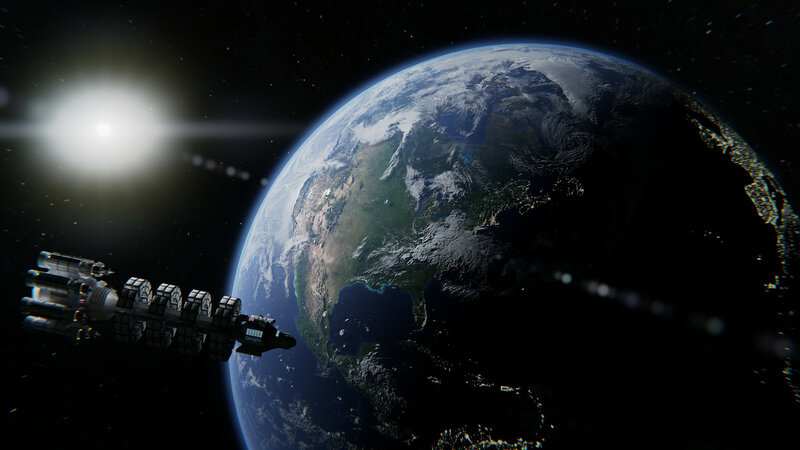 It's inspired by that other space station that Goof threw into the background of the Outpost 2 Main Menu Screen thread. I basically started copying the similar design, except my personal compulsions lead me to symmetric designs. And what's likely the final product. I have one at 4x the resolution, if anyone wants/needs it. Just let me know. Yes, but all means post the high res version. I'd like to be able to check out the detail. Here's the higher res version. This one is an oversample, so that I could downsample and reduce the noise a bit. So you'll see more detail, but there's also a bit more speckle in the image. Also, it's pretty big so I decided not to embed it as an inline image. The texturing on the rockets needs more work, honestly. The model itself looks good. Nice. The bottoms of the landing modules look a bit funny to me. Seems like too much detail. I would expect a flatter surface there. That's fair. To be honest, I got a bit lazy on the texture on the landers, but also I never intended the giant image to be the "used" version. It was an oversample so that I could kill some of the noise in the image, so I worried less about having a snazzy texture for the landers because a lot of the detail gets lost. Also I was wanting to reach completion on this project and move on...Keeping to a sort of production rhythm. That being said, I knew I was lazy about the landers in particular (also lazy about the little probes tucked beneath the landers). 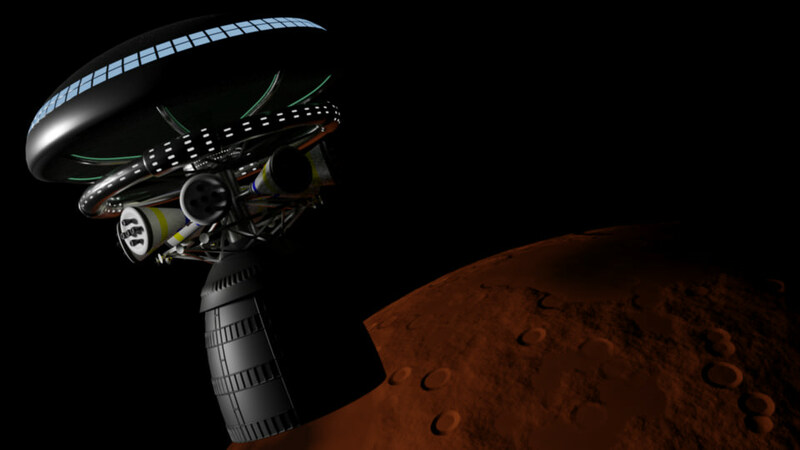 So the next project that I started is actually to focus on a lander by itself. For the starting point, I've been recreating an Apollo capsule/service module for practice on the model and the (very shiny) textures. I look forward to seeing more work. You've progressed considerably since you first started posting. White Claw, I like your attitude about keeping to a production rhythm. 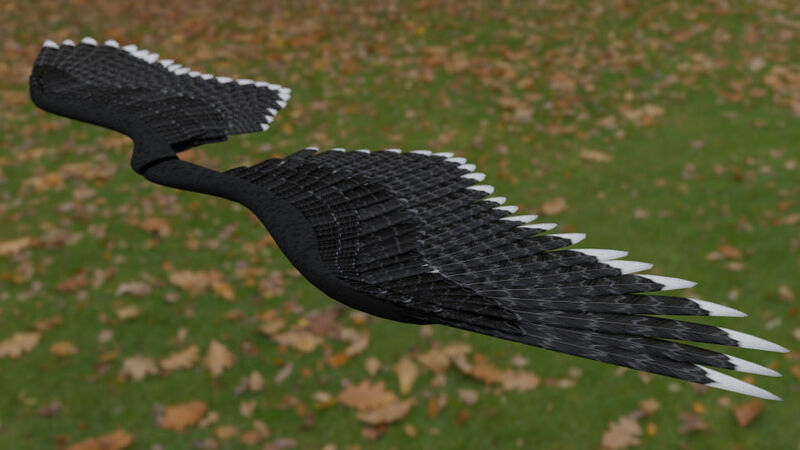 I wanted to work on something more organic instead of hard surface modeling, so currently I'm working on making an eagle. 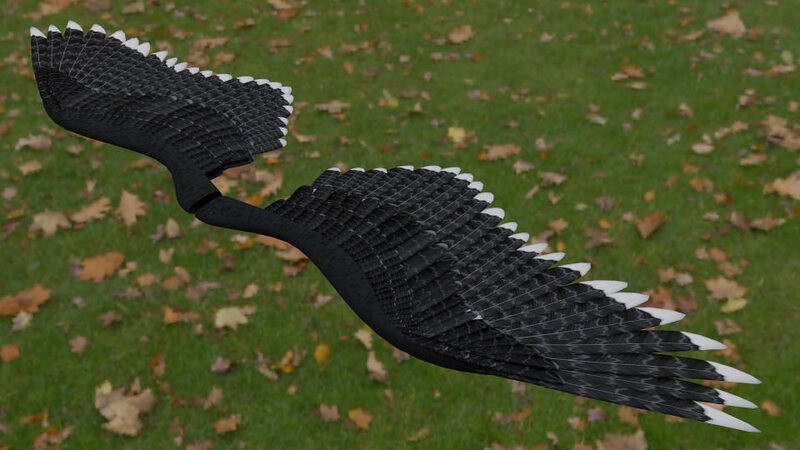 Here's the progress on the wings (the body has a long ways to go). Currently, all of the feathers are individually modeled, but I might build a single mesh structure at some point and bake the textures onto a more simple model. That's quite good. You continue to impress me with your progress (and patience with Blender!). Huh, wow. That is quite organic looking. That looks like it took a lot of time. My eyes are kind of drawn towards the edge closest to the camera, like there is something odd about that one part. Like the feathers overlap in the wrong direction or something. I sort of feel like the 3D effect is somewhat lost there, and it looks significantly flatter. Perhaps even confusing. The rest of the wing looks like it has a lot of depth to it. Is this maybe a perspective thing from being too close to the camera, or is there something structurally different there? You continue to impress me with your progress (and patience with Blender!). Thanks! It certainly takes patience and humility. My eyes are kind of drawn towards the edge closest to the camera...I sort of feel like the 3D effect is somewhat lost there, and it looks significantly flatter. I think I see what you mean. Somewhat strange though, because there's nothing particularly different about those feathers compared to the others. Though the smaller feathers do seem to look fatter (which is possibly a mistake itself). Though upon looking at my reference photos again, I noticed the feathers out at the wing tips (called Primaries) are not anatomically correct. The rachis (the quill-like part that runs down the middle) is not properly placed. It's too centered in the render. Perhaps your brain knows that these feathers are supposed to be different, but they aren't (so it somehow looks "off"). I will fiddle with that part, and they also need some shaping. Maybe that will help. The feathers stack on top as they progress from the wing root out to the tips. So the overlap is correct, but perhaps it's too much (too big of a gap). Though upon looking at my reference photos again, I noticed the feathers out at the wing tips (called Primaries) are not anatomically correct. The rachis (the quill-like part that runs down the middle) is not properly placed. It's too centered in the render. I love how much you get into the details. You really go above and beyond there. It's easy to tell you're not just ... winging it? Huh. Well that's just it. I have trouble telling which way the feathers stack. One moment I think they are going one direction, then I look again and think they're going the other direction. I keep searching for detail trying to figure out which way they stack. It also feels like there is some curvature across the width of the feathers in the back of the image, but not towards the front. The effect seems to be lost for me right about where the spread of the feathers produces a gap beyond the white tip. I'm also just now noticing the white tips look elongated and sharper closest to the camera. And it feels like the wing extends further back there, rather than out to the side. Are the wings mirrors of each other? Or custom on each side? I still find myself wondering if perhaps the viewing angle is playing tricks on me. It's easy to tell you're not just ... winging it? Huh. Well that's just it. I have trouble telling which way the feathers stack. ... I keep searching for detail trying to figure out which way they stack. Seems more obvious to me, but I suppose that's because I've been staring at it for a while. I did notice one spot on the primaries where they don't overlap properly, but your comment sounds more like an overall issue. Are you referring to the mid sized feathers, along the middle of the wing? The smaller feathers don't actually have any overlap (or maybe only slight). I think I need to sharpen the edges on them a little too. They appear more rounded than intended (as you pointed out) and perhaps that's causing illusions. The far wing is a mirror of the near wing. I imagine the view angle is playing some tricks, because it is a pretty sharp angle. If it were a real camera, the far wing would likely be a bit out of focus due to depth of field. There's a lot of other details in here that need cleaning up too. I think this is one of those things I could pick at for hours. How about this? I went in and adjusted the feather overlap, and (more) properly built the primaries at the tips. I also fiddled with the textures a bit. I think the feather you pointed out was actually the one that caught my eye. It's hard to see the difference, but that was the one I was staring at the most. Nice how you presented the level view, that really shows the symmetry. I think some of my perception was from the camera angle. With the angled view, the far wing looks quite natural. With the close wing, it looks a bit flatter towards the camera, and the 4 or 5 feathers on the end look a bit dagger like. 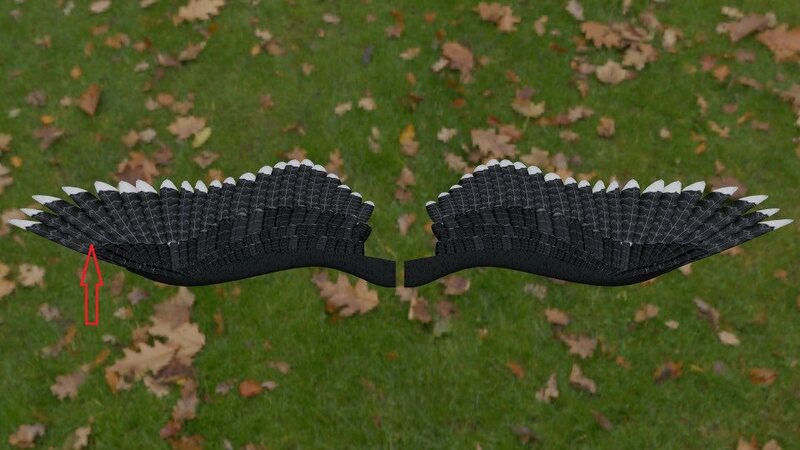 Almost like there is a slightly mismatch in depth between the geometry (seems 2D) and the texture (appears 3D, with a slight curve, like roof tiles), but only visible from an angle where they don't align, and from a distance close enough to see the detail. Oh, and maybe that's it. The texture looks a bit blurred close to the camera, like it's not high enough resolution to be sharp and detailed at that distance. Regardless, it's still a very convincing wing. No need to obsess over it. You've already well surpassed the "good enough" stage. 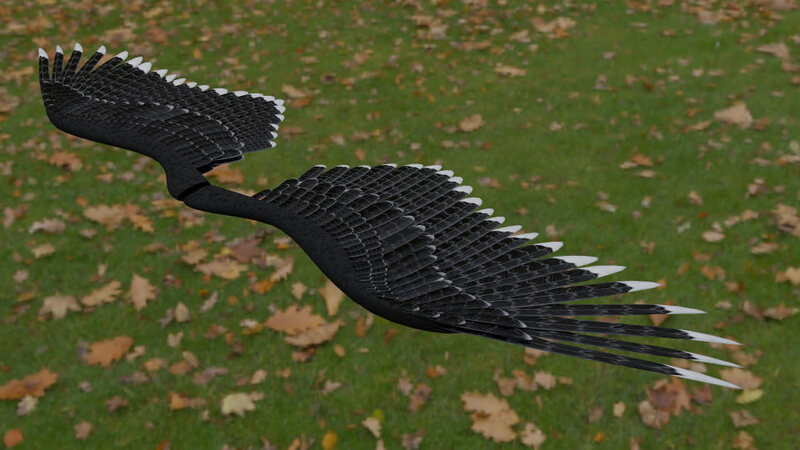 I rather like the detail in the new version, especially the short feathers on top near the front edge of the wing. In standard fashion, I am emerging from my month-long disappearance. Still working on Blender, and though its not OP related...it is space related. So I thought you guys might enjoy. What do you mean not Outpost 2 related? That is clearly a colony ship leaving Earth before a giant meteor impact.